John Brennan, Adm. Michael Rogers and James Clapper arrive to meet with the Senate Intelligence Committee as part of the probe of Russian meddling in the 2016 campaign, Washington, May 16, 2018 (AP photo by J. Scott Applewhite). The New York Times reported yesterday that the U.S. is targeting Russian cyber-operatives involved in efforts to disrupt America’s congressional midterm elections in early November. 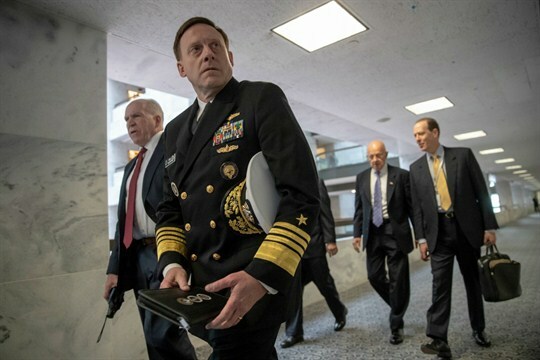 Though there are few details on what measures have been taken, it would seem to amount to the cyber equivalent of a brushback pitch to deter individual actors by making it clear that U.S. Cyber Command has them in its sights.